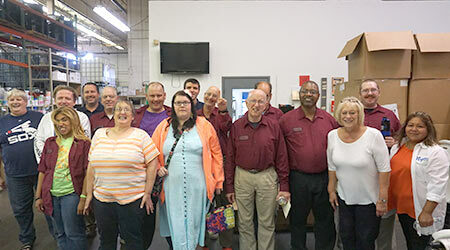 Nyco Products Company recently celebrated the first anniversary of their Supported Community Employment program in connection with the Helping Hand Center (HHC) of Countryside, Illinois. Nyco, a premier manufacturer of specialty cleaning chemicals and sanitary maintenance brands, and Helping Hand Center, a nonprofit organization that serves children and adults with disabilities, initially began the program with a handful of HHC clients who were hired to work on the Nyco production floor two days a week. The initial success of that venture resulted in further growth of the program, which now includes a total of 13 employees who work at Nyco three days each week. Jeanne Stahurski Wilson, Administrative Services Manager at Nyco and one of the founders of the Community Employment Program, commented on the program’s success, “It has been wonderful for everyone here. Not only are the HHC clients great workers that add to our efficiency, they also continually inspire us with their positive attitudes. Their smiles are terrific morale boosters for our team.” Stahurski currently serves as program liaison. The anniversary celebration included a ceremony recognizing and thanking each employee for his or her contributions during the past year. Special thanks was expressed to Breens Uniform Rental and Linen in Countryside, IL, for providing each employee with a Nyco uniform free of charge. The event was followed by a company luncheon that included cake. Helping Hand Center is a nonprofit organization that has served the greater Chicagoland area since 1955. They offer a range of programs and services, including outpatient therapies, early intervention, a school for children with autism, high school transition, residential homes, employment services, adult developmental training and special recreation programs.